Check out the below article outlining best storytelling practices from Margot Leitman, a champion storyteller at The Moth. Earlier this year, a group of students from Zanzibar, Tanzania created a video to examine why the language they’re required to speak at school is different from the one they speak at home. This video raises a lot of issues, but for the sake of this blog focus on these two when watching: how some languages are taken as more valid than others and what politics are happening in an academic space. What languages—or rules of language—are more valid at Barnard (or at whatever school you attend), and how are those rules political and/or restrictive? I think we should include trigger warnings in our syllabi. No one wants to be caught by surprise when an upsetting issue arises out of the blue in a core text. By including trigger warnings, students can be aware of what they face and prepare accordingly. The danger, however, is when we cease to read texts because they can be triggering. Literature is meant to trigger a response. Great writers make us think, make us question, and make us peer inside ourselves and confront the uncomfortable facts that lie at the core of human existence. This can be scary and upsetting, I know—but it is not an oppressive act. Discomfort does not equal oppression. Triggering literature does not equal disrespect for difficult individual experiences. I worry that with the growing emphases on trigger warnings, the list of things that we can’t read (and say and bring up in class) will grow longer and longer. What do you guys think? Let’s discuss. Is the passive voice a tool of historical passivity? Explore personal and political expression as self-care with the Barnard Writing and Speaking Fellows at Well Woman! And, of course, there will be snacks. Come hang with us and write to be read, speak to be heard, and be well. 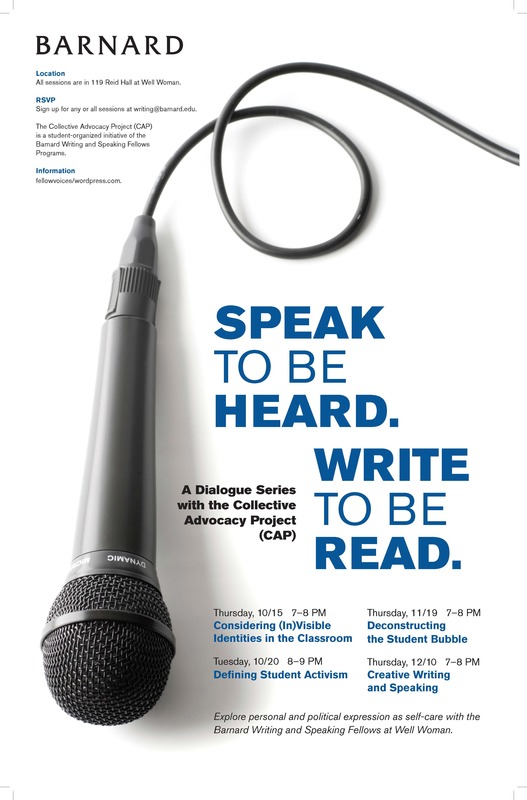 This semester the Collective Advocacy Project (CAP), a student-organized initiative of the Writing and Speaking Programs, will be hosting a dialogue series at Well Woman. Each peer-directed workshop, organized around a single theme or prompt, will use writing and speaking exercises to encourage peer dialogue about student advocacy in-and-out of the classroom. Questions of identity in the classroom are enormous and difficult—they address our entire lives, after all—and they often bring up emotions that disrupt a classroom’s agenda. There can be an unspoken classroom code of conduct that, in order to preserve quietude, demands a “neutral” identity of students, sometimes at the expense of student well-being. Truly, there is no such thing as neutral, and assuming a “neutral” identity is an erasure for whoever attempts it. How are aspects of our identity silenced to serve a “neutral” classroom? What physical aspects of our identities are not silence-able (in that others observe it about us), yet nonetheless attempted to be silenced, to be “neutralized”? Some related questions we hope to cover: How do you experience trust in classroom discussions and seminars? Considering the (in)visibility of identity, which aspects of your identity do you feel are visible in the classroom? What can a student do with knowledge learned in class that is somehow upsetting? How do we engage critically with our emotions (and those of others) in class without invalidating those emotions? We’ll be holding three more dialogue workshops over the course of the semester, so don’t worry if you are interested but can’t make it to this one. All sessions held in 119 Reid Hall (Well Woman). Sign up for any or all sessions at writing@barnard.edu. The Collective Advocacy Project (CAP) is dedicated to uncovering the intrinsic potential of the Writing and Speaking Fellows Program; CAP seeks to make Barnard students’ written and spoken voices visible beyond the classroom and in all aspects of life, expanding its parent Programs’ mission of validating students’ voices within the classroom. We believe that every person’s voice is significant, and that making visible student voices is activism. We believe that understanding one’s potential for activism is vital to a liberal arts education and fundamental for a just society. CAP, as a project of the Barnard Writing and Speaking Programs, seeks to enhance student activism on the Barnard/Columbia campus. In Fall 2014, a group of upperclass Fellows—at this point several semesters removed from their Writing and Speaking Fellow “training” courses—wished to revisit the communication pedagogical theories grounding their Programs. They met for a discussion group, led and organized by Writing Program Director Professor Pam Cobrin. The subject was an article by Jennifer S. Simpson titled “Communication Activism Pedagogy” (in Teaching Communication Activism, ed. Lawrence R. Frey and David L. Palmer, Hampton Press, 2014). From the start, our project has been to uncover and expand the intrinsic vision of the Writing and Speaking Fellows Programs and directly apply it to social justice issues on campus. In 2015 CAP became a grant-funded, student-led project of the Barnard College Writing and Speaking Programs and consists of a rotating cast of Writing and Speaking Fellows. For us, CAP stands for the Collective Advocacy Project, but it is also the acronym for the radical communication activism pedagogy. We believe communication pedagogy is political and, as students dedicated to learning for creating equality and countering global oppression, it is our responsibility to develop advocacy skills as a part of the Barnard College Writing and Speaking Programs. The members of CAP are not committed to any particular strand of activism or cause. The aim is not to promote or devalue causes but to facilitate dialogue on campus. Two reading related events were recently brought to my attention: 1. The #rockthosereads movement across Harlem, and 2. Светлана Алексиевич (Svetlana Alexeivich) recently was awarded the 2015 Nobel Prize in literature. The grassroots organization Total Equity Now, founded by Joe Rogers Jr., has declared the first day of every month “Literacy Across Harlem Day,” and on these days, Harlemites are encouraged to carry reading materials outside of their bags, rocking their reads in support of reading and literacy. As far as I can tell, it doesn’t matter which reads you’re rocking, as long as they’re reads. Her books are not published in Belarus. How are the Belarusians supposed to #rockthosereads of their Nobel Prize Laureate? In many places in the world, people rock restricted reads. What is the danger of rocking reads? What is the power? I wasn’t always as comfortable as I am now with the prospect of public speaking. During my 8thgrade valedictorian speech, I read off my paper the entire time. College student me would have scolded 8th grade me for that ( I would have told myself to use an outline with bullet points). The point is, no one grows up feeling confident speaking in large crowds. It takes time to develop those skills and that confidence. That’s why I wanted to share this article I recently came across on Forbes.com, which mentions some popular names in the media and the difficulties they had with public speaking. We may all think of Julia Roberts as a fantastic actress, but little did we know that she had stuttering issues as a child, and received speech therapy. Now she’s speaking at the Guild Awards! Same goes for Warren Buffet, who was so uncomfortable with public speaking when he was younger that he purposefully avoided college classes where he might be required to make presentations. With diligent practice, he overcame this fear. Same goes for Winston Churchill, who was a lisp and would freeze up early in his political career. Again, what got him through it was diligent practice. What do these individuals have in common? They practiced! That’s the key to mastering public speaking. As the article concludes, practice breeds competence, and competence breeds confidence. Certain individuals tend to underestimate how much practice can help us in overall improvement of daily interactions. For instance, I practice in trying to reduce the amount of fillers I use in my everyday speech. There are always aspects that we can improve upon.